I had told the boys that just a few short weeks before I had long, blond hair. There were photos of me on my website. So as I sat down to collect my emails, they found a computer of their own and pulled up my photos. I typed fast and furiously, trying not to be distracted by their gasps, snickers and conversation. Oh, goodness, where to begin. I’ve been tromping through such remote places lately that I haven’t found the internet for days. But going inward and concentrating on my journal has been good. I have managed to ditch the Italian and now have two young, Germans: Simon, whom I don’t yet know much about, and Martin, a handsome boy (at 24 they are still boys), who told me he has a crush on Sharon Stone—an older woman with short hair. I laughed at that. I have walked with Martin for two days now. In the first week, I have averaged 18 miles a day. I find it amazing. I believe I’ve lost about a half pound a day. I laugh at the thought that this is much more fun than liposuction! And that perhaps by my 40th birthday, I’ll have the best legs of my life. I do find that every day is a bit of an exercise in pain management though. Body parts are logging in with their concerns and complaints. Surprising body parts, parts I never hear from. The one part I thought would talk to me the most in protest, my left ankle, has been a trouper. Nothing. No protesting, no complaining. The refuge last night was down and dirty but Simon caught up with us having walked 20 plus miles that day. And so the three of us laughed at our aches and pains, rested hard, and have quite a train through the mud today. It’s muddy but the sun is shining. We are here in Santo Domingo with hopes of putting in a few more hours. They are tolerating my need for internet, waiting for the old broad who impresses them with her strength and determination. Simon is having quite a time with blisters. I still have none. I twisted my ankle in a puddle the other day and struggled with a strained Achilles for a bit, but NO BLISTERS. Hah. It amazes me what the body can put up with. Every night when I hit the bed, I sleep like a rock for a good 8 to 10 hours as my body repairs itself. But the other night, I had a dream, the first one I remember, and it was about you! Normally I dream A LOT, and I remember it all, but here, it’s been all about rest and repair for the next long day. Anyway, I dreamt that you were pregnant, and let me tell you how adorable you are as a pregnant woman! Great fun. In any case, according John Edward, who instructs me in such things, first you take the dream literally, then you assume everyone in the dream is you, and then you look for symbolism. This is the short version as I am due to hit the road very soon but I do think that this is what I’ve been feeling about you and about myself, something inside that is growing and will emerge, in you and in me. You are giving birth to something, as am I, and it is beautiful already. The boys are trying to look over my shoulder to see what I’m writing about them. Did I mention how cute they are? Simon with his cherub cheeks, Martin with his embracing smile. But I am here to commune with… what again? Don’t know how long I’ll travel with the boys. They do delight me. We are hoping to push on to Belorado tonight, which is another 15 miles—if that’s at all possible for these aging legs. After that, the elevation and terrain gets tough again. It’ll be cold and hard up there on toward Burgos—the biggest city I’ll encounter on the trail until Santiago. I am ahead of schedule, not that I have one, but I’ve been able to put in more miles than I’d anticipated. The boys are distracting me. More, soon. I think of you, I dream of you, I smile at the thought of you, I look forward to seeing you, and I am nourished by your notes and your thoughts. Hugs. Big ones. Full. Warm. After walking 10 miles, nearly all of it uphill, we set off for another 15. I had my doubts. It was rolling terrain but again, most of it was uphill. As the miles wore on, we became more silent, particularly me. I had to conserve everything I had. The last three hours were sheer agony, and the final hour was just short of hell. Martin tried his best to cheer me up, but I was shutting down by the second. He became concerned, and rightly so; I’m sure I was ashen. By the time we’d reached the refuge, the sun had set and all of us were stumbling. I don’t think I’ve ever ached so much in my life. My feet felt like open sores covered in bruises. I couldn’t imagine taking another step, not that night, not ever. But we opened the door to the refuge and just inside was an internet station. I perked up immediately. We walked the long hallway to the beds only to discover the Italian, who grinned upon seeing me. Martin told him we’d walked 41 kilometers, which we were sure was unbeatable. But the Italian clocked in with 44! I shook my head, dismayed. Once again I was faced with him and the meaning of his presence. What is it that the men here are showing me, I thought. What are they giving me? One, I have rejected. Why? Was he too attentive? Was it his energy? I don’t know. And these Germans—Martin, who gets younger every day, and Simon. Well, Simon, he doesn’t want anything from me; he’s just a fellow pilgrim. And I am drawn to him the most. I made dinner for the boys–pasta and stir fried vegetables like the Canadian divas and I had done–and then I spent hours recharging in front of the computer. It was the best way I could imagine spending my evening. I needed the time alone. And time communing with home. I’d gotten a response already from Maureen. Oh, it sounds so hard, and you sound so brave and determined, but how about checking into a hotel and giving yourself a little break? We will not think any less of you, all of us out here huddled behind windows and walls, plugged into our lifelines. In fact, I think tasting a bit of Spanish hospitality for a couple of days would be quite the thing to do. It’s an opportunity. You’re going through so much, I start to fear for you, but, yes, it’s what you were seeking. I am sending you a great encircling hug, and then Jan joins in, and then Mirra and Richard, and we’re rolling around and laughing and laughing till we join in your crying and then we laugh again. Thanks for the dream. I too think it’s going to be a beautiful baby. Will you be the godmother? Love and hugs. And let me walk the next mile for you. I immediately sent a return note. It’s late. I got to the inn this evening after logging 25 miles, and I ache. But I ate, and there was a hot shower and wine and internet. So I get to sit here in the quiet, pretend it is home, and reread the lovely notes I am getting. I covet yours. I will check into another hotel. Soon, I’m sure. Don’t worry. I will need long hot baths and alone time. I can feel the need for that. I have been living so simply. It’s almost easier being simple. And it is something, this walking. Nice. Tough. Beautiful. Hard. Good. I’m not quite sure why I have all these boys around me, but it does feel healing. I am healing so much. Today was sheer pain though. I don’t think I can walk another 25 miles. I worry about injury. Once is enough for that. And I pray for some warmth. The cold is getting old. But I am still open to all of it. And I’m stunned. I thought there would be despair and agony and emptiness. At the moment, beneath it all, there seems to be only gratitude. I am grateful for you. Thank you for thinking of me. I will return. I will look forward to your smile. And a really big hug. That would feel good to me right now. But the he note is sustenance enough tonight. My next email was to my dear Lauren. I got to the refuge tonight to find the internet! It does make me happy. I logged 25 miles with the boys today, and that’s all this old girl can take. The last three hours was just horrid. Too difficult. It is still cold. I’m not minding it outside, but inside, after a long trek, I like warmth, and not all the refuges are warm. I am managing. Well. In fact, I’m astonished. It’s day nine, and I’ve walked 165 miles, which is unimaginable. The days are long and filled with thoughts, and by the time I get to the refuge, I can’t remember anything and I’m weary. Weary in a way that brings new meaning to weary. Deep depletion. Everything aches. And I think I can’t take another step. But I know that I will sleep hard, and in the morning it will be another day. To walk. The boy, Martin, is smitten. It’s kind of fun, but he flirts like a boy. He doesn’t have the courage to just come out and tell me his thoughts and desires, and so he backhands, all day, and it does get tiresome. And so I cherish having the other boy, Simon, to disperse some of Martin’s energy. I like the company because they both make the journey so much easier. The language barrier can be a big drag, and they both speak Spanish better than I. During the walk, we are mostly silent, and so I still get alone time to ponder. I cannot do the long days though so I may have to part company soon. I don’t know what tomorrow brings, but it’s back to the high elevations which I think means snow and cold. Goodness. I have had my fill of those things by now. More. I’m sure of it. My friend Henry, from New York, sent his first note on the Camino. Henry was also turning 40. He was celebrating in a very different way, however. And he was clearly under the illusion that the Camino was in a more inhabited area of Spain. I am wondering where you are right now. Probably in some great little village along your long journey hanging with the local folk, eating some tapas, and hopefully having a nice glass of wine. I printed out the map of your excursion, but I’m not certain what is the beginning and what is the end. It looks like Rioja is somewhat in the middle of your trek, so I pulled out my Atlas of Wine’s book to find out that Rioja was considered the Bordeaux and Burgundy of Spain. I hope the trip is going well, and you are having an experience of a lifetime. Please just remember to treat yourself to that occasional shower and hotel bed. I can only imagine it would be a nice comfort to have after walking 20 plus miles. I am sorry, we did not have another chance to speak before you left, but it was understandable considering how busy we both were. The last couple weeks have been a wind storm mainly dominated by closings, moving, unpacking, and prepping the new place for some work to be completed while I’m gone. This coming Friday, I get to leave behind the snowy weather of the Northeast and head to the Disney World of the Bahamas, Atlantis. I have a large group of family and friends making the trip as well. I think we are a total of 23 people, seven of which are under the age of ten. It will be a bit chaotic, but a lot of fun. The only thing I know is that I will be relaxing on the beach and reenergizing for the happenings of the next 40 years. Anyway, I hope you are doing well, and I look forward to seeing you when you return in April. Of course I responded immediately. Thank you for your note. And your research. Yes, wine. And lots of it. It is so cheap here. 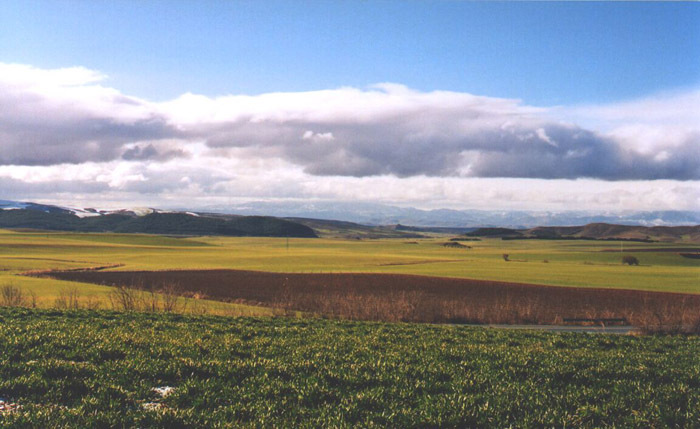 Today, though, I left La Rioja, and I’m just beginning the Burgos region. I’ve logged 165 miles on this old, tired body. Today was the longest at 25. Can you say hobble?! 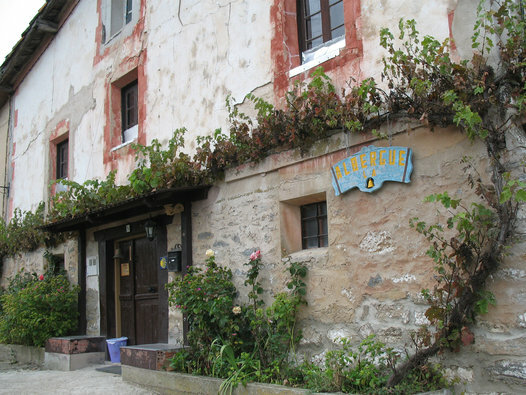 I started at a small place in France called St. Jean Pied de Port, which you should be able to find on your map of the Camino. I am writing you from a relatively large (by Spain’s standards) town called Belorado. There is internet so you know there are people. In two days I’ll be in Burgos. It’s cold. Damn, they’re having freaky weather here, and I’m just in time for it. I’m not minding it too much; I have plenty to keep me warm, but yes, I’m treating myself to a hotel once a week where I can sit in a hot bath and soothe this tired body. Can’t wait to see you. Have a great time away. I was dead tired but wanting to get out one last note to my dear friend Brenda whose cards and quotes and thoughts were so much a part of my days. I love your emails with your thoughts and all your beautiful word selections. I don’t always have time to respond quickly because of these crazy midday siestas and the remoteness of where I am, but I’ll respond when I can. I want you to know that the night I spent in the hotel, I lit the candle you gave me, sat in the tub and drank wine. It was absolute heaven. I’ve been joined by two new companions, one who is very sweet and flirts endlessly. That’s getting old but I do like his company: he knows the language and makes my life easy. He is so sweet in the way he checks in and makes sure I get to be alone when I need to be alone. The other seems so gentle and soulful. I hope to have time with him, just the two of us, to scratch the surface of him and begin to see what’s inside. There is something warm and lovely in him. I’m not quite sure what the boys have arrived to show me, tell me, teach me, but I do think about it, and I know it is healing in some way. I feel the healing. Soon, though, I’ll need to be alone with my thoughts again. Thank you so much for your letters. I have opened number two now, and I carry it in my thoughts all day. I do look forward to getting through it, as I do, and getting back to my life. I look forward to having long chats with good wine and catching up. 2 comments leave a word. or two. Regarding Harry’s assumptions about an “inhabited area of the Camino”, I’m working with a young lady from London, who mentioned that she had done 5 miles on the Camino a few years ago. When I asked her about it, I was *shocked* to hear her describe it as full of people and crowded! I assumed everyone’s trek to be similar to yours (!! ), but she went in the height of summer, and said it was as crowded as the 3rd Street Promenade. Reconciling the two different images in my mind is quite funny. Keep writing – it’s fascinating. Yeah, the dichotomy is striking. I went during the “winter” (because March, I guess, is considered to be winter) when you hoped a refuge was open when you got to it. In the summer, the hope was to get to a refuge early enough to get a bed. I knew this before going. 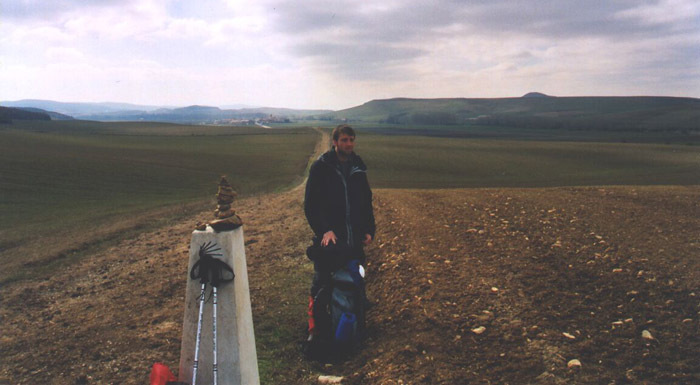 I had no interest in fighting crowds on the Camino, I wanted to have more of an internal experience. And, because it was a birthday journey, thankfully mine came during a good season… though stay tuned because the rains, they are a-comin’!